Aria Property Group have submitted a DA to build two staged 30 storey residential towers located at 64 Peel Street in South Brisbane. The development has been designed by Rothelowman architects and consists of 432 apartments, 6 ground level retail tenancies and a rooftop pool and recreation deck on level 29. The west tower consists of 168 apartments, with the East tower consisting of 264 apartments. 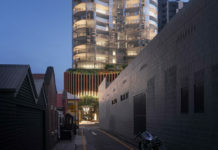 The project signifies Brisbane’s continued densification of the CBD fringe with the South Brisbane Neighbourhood Plan allowing buildings up to 30 levels high in some areas. The towers utilise fundamental structural elements applied in innovative ways to make a positive contribution to the surroundings by creating architecturally striking and unique envelopes visually interesting from both close and from far. Both buildings apply a similar ‘wrapped’ super-graphic aesthetic across the two sites. The design concept explored the notions of wrapping within its context. The latticework patterning of traditional Queenslanders and the later interpretation through breezeblocks has been manipulated and reinterpreted into an architectural language and scale that emphasises the patterning in a larger visual aesthetic suitable for taller built forms. The design also engages with the concept of wrapping and pattern making by looking to nature’s best examples – that of water bubbles and their ability to conjoin to create a strong enclosure that is also visually interesting when viewed as a series of inter-connecting elements or bubbles. Both towers build on the concept of wrapping and textured pattern-making in different ways – the eastern tower overtly celebrates the patterning with shadows encouraged to emphasise the macro- scale shapes whereas the western tower subtly makes reference to the concept with the graphic slicing through the glazed flush façade. The public realm is celebrated in both towers with recesses, overhangs, cantilevered landscape planes and highly activated ground planes evoking a strong sense of place and encouraging the public to interact with the building. The highly articulated built forms create a sense of detail and personalisation that is lacking in most buildings of this scale. The patterning encourages the passer-by to view the building in detail and allows the striking sunlight that is a trademark of our climate to create rippling and always changing shadow effects across the building façades throughout the day. The lower levels are highly articulated with recessed planes of metal and glass interspersed between dynamic, angular cantilevered landscapes planes. Retail areas are double storey in height and extend to triple height sleeved zones on the Peel and Cordelia Street corner. The white patterning of the tower continues to meet the ground plane and allows the passer-by the experience the full slender tower from its foothold. The DA for this development is (A003895901). Meanwhile down along Fish Lane, Aria also appear to be working on a DA to activate a section behind 79-97 Melbourne Street (Stockland Building) along Fish Lane. 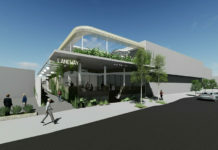 According to the architect, the adaptation of an existing laneway integrates an existing 3 meter-high brick wall on the kerb line which are to be cut open to create windows onto the lane from a new dining courtyard that occupies the previously unused garden space between the walls and the existing multistorey office building.